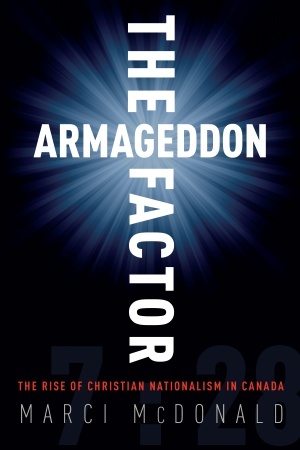 Marci McDonald has started a blog based upon the book she published last year, The Armageddon Factor: The Rise of Christian Nationalism in Canada, which is in turn based upon her earlier article in The Walrus, “Stephen Harper and the Theo-Cons.” The article is a concise review of the American-inspired and Alberta-based republican nationalism that most Canadians do not seem to know anything about. It will no doubt surprise many how deeply embedded this movement is in the Conservative party, and that it seems to be achieving increased access to the institutions of government. It has, at the very least, ready access to the Prime Minister’s Office. Religion is of course a private matter. But when it begins to impinge upon the public sphere, particularly in government, then it must be scrutinized and made accountable. Over the next little while we’ll be rolling out a number of passages from Frye in which he discusses the necessary subordination of religion to secular interests in a democracy. A thorough-going review of McDonald’s book here. An interview with McDonald on TVO’s The Agenda here. This entry was posted in Canada, Current Events, Politics, Religion on May 22, 2011 by Michael Happy.